Get an official Xbox One storage upgrade for less with this early Black Friday deal. It's not just the consoles that we like to cover with our Black Friday Xbox One deals coverage. After all, we know many of you already have a one and are looking for juicy deals on games and extra accessories. And if you're thinking of getting a console soon, or are buying one as a present, this will be an excellent purchase alongside it. Yes, you'll find that top of the most wanted lists for many gamers is more storage for their games. 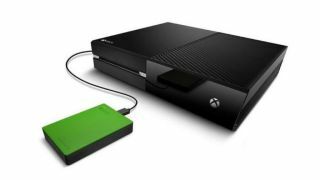 So that's why we've tracked down a pair of excellent deals for the official Xbox One external hard drives designed by storage specialists, Seagate. In the UK, we've got an excellent saving with an £84.99 price on a 4TB hard drive at Very. While in the US you can save $20 on a refurbished 2TB drive for just $79.30. There are plenty of other Walmart Black Friday deals available too. Initial Xbox One consoles came with a measly 500GB of storage, although 1TB is the new normal for all Xbox One X and most Xbox One S models. However, we filled up 1TB in no time with 50GB seemingly being the general standard for an average game's mandatory install size. Hell, Red Dead Redemption 2 is 100GB! These external options are official Xbox branded items, which usually keeps the price a little high for our liking as non-branded external USB drives have been much cheaper. Not today though! External drives are the only way to expand your Xbox One storage capacity as it doesn't support internal HDD upgrades in the same way as the PS4 consoles. Plugging this into a USB slot and slipping it alongside your console is a quick and easy upgrade that we can all live with - and no you don't need to plug this hard drive into the mains, it's powered solely by the USB cable. And yes, if you're a bit of a renegade, you can totally use these with a PS4 instead. That's an enormous Xbox One hard drive upgrade and should be plenty for loads of massive install files, DLC drops and a few years worth of all those free Xbox Live Gold games that you will get around to playing! This is a fantastic price though and cheaper than most retailers are charging for the 2TB option. Just to reiterate, this is a refurbished product rather than a brand new and sealed unit. But seeing as discounts on the official Xbox One hard drives are rare to say the least, we're very tempted by the $20 discount. A 2TB expansion is plenty for most gamers, especially if you find you only have to delete one or two games to install a new one. This should you see through to next-gen really. There will be plenty more deals to enjoy in the next few days and we'll be rounding up the best of the best in our Black Friday deals guide.